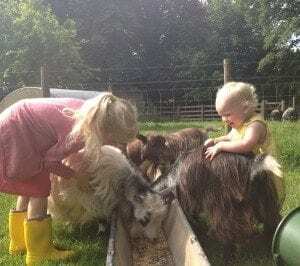 Children f eeding our close-knit herd of pygmy goats by hand and then giving them a big, big cuddle is a familiar sight at Tredethick. 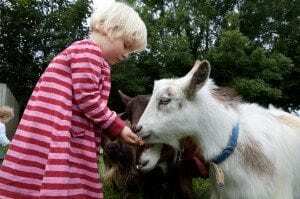 Farmer Tim will ceerfully offer a free holiday to any child nipped while giving our goats their breakfast. Why? Because it’s never happened yet! Pygmy goats are friendly, fun and utterly addictive. Spend a little time in their paddock to find out about the characters and dynamics of the herd. Originally from West Africa, pygmy goats have been keep as pets in the UK for decades. Most of ours come from the less exotic climes of Devon! Chocolate is the elder — at 11 years old — she likes nothing better than a head scratch against your wellies. Squeak is next in seniority, she is shaggier and has the longest beard. Casper – the only wether (that’s a castrated billy) — was given to us by the man who maintains the Lavazza coffee machine in the soft play. He was breeding his nanny goats and needed to rehome Casper. Spying our happy herd on a routine visit, he offered him to us. Casper is extremely friendly, athletic and — to be frank — greedy. Keen for food and a cuddle. He can stand on two legs to grab apples from the trees (and strip the branches of bark given half a chance)! Goats will eat most things, Farmer Tim left his fleece hanging over the fence once and there were a couple of holes when he picked it up! Gloria and Gaynor were bred by an award-winning goatkeeper in North Devon. The breeder names all kids in a particular year by the same initial — hence our 70s disco eference. The two kids (Izzy and Ingrid) were born in this year. Izzy is particularly affectionate (just ask Farmer Jenny) and Ingrid is a real beauty, with her white, brown and black markings. You might think that Izzy and Ingrid (or Gloria and Gaynor) are sisters but actually Ingrid and Gaynor are the most closely related — sharing thesame mum.  If you see goats sitting down munching in the afternoons, they are usually chewing the cud. Goats are ruminants — the family of animals which needs to chew food twice to digest it. They regurgitate semi-digested food for a final munch! There’s been a few goat great escapes over the years. On one occasion they found their way to Lostwithiel and sampled a few gardens before they were rounded up and herded home.